Powered by knowledge and expertise, Mahavir Tex Prints Pvt. Ltd. has Leeza Store is Started in 2017 as trading as well as manufacturing company. This is a sister company of Marudhar Keshri Group. Our group has presence in the textile industry since 1994. We have operation in Kolkata, Surat and Jaipur. we Manufacturer women Ethanic wear ( Saree, suits, lehanga, kurti). we have also involved in Technical textiles products like Baby Dry sheet, bed protector and other laminated fabrics. They also deal in different type of dyed fabrics and dye chemicals. We have employee strength of 50 people. Leeza Store is our front face for our online as well exports. To offer our customer with all type of fashionable, traditional, designer and enduring attire and accessories. We offer our customers top quality products with excellent prices. Create market awareness on quality design at accurate cost. Continuously apprising our customer with today’s trends, ongoing traditional attire in demand with the best prize in market. Culture of India raises to the religious beliefs, customs, traditions, languages, ceremonies, arts, values and the way of life in India and its people. India’s languages, religions, dance, music, architecture, food, and customs differ from place to place within the country. Among all these India is more famous and recognized for its clothing. Indian clothing is known for its elegance and traditional wear all over the world. Though clothing greatly varies across the country the most popular style of women dresses is a very well known, draped garment “Saree” for years. As we all know 60% of Indian female prefer wearing saree on daily basis while the remaining women definitely wear them occasionally. And when you ask any women about sarees they definitely and very excitedly talk about the beautiful Surati sarees. 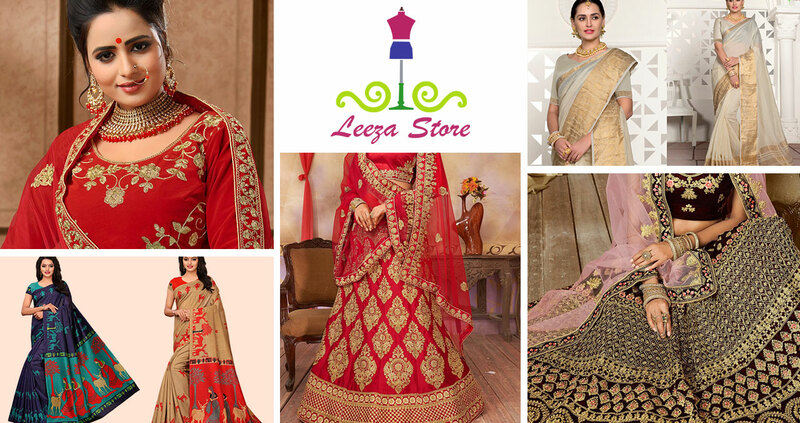 In Leeza store we do our effort to fulfill your choice of traditional to trendy attire at affordable prize sitting at your home. We are an online shopping portal catering to wide spectrum of women’s clothing including designer sarees, casual sarees, bridal or wedding sarees. Leeza store brings you with exclusive variety of traditional, trendy, embroidered and zari work attire. Our team is making continuous effort to offer and inform you with wide ranges, collection of different attire. Team is continuously engaged in satisfying our customer with best quality affordable prices and exclusive discounts. We have main focused on attaining maximum customer satisfaction. All the designer lehenga & sarees products provided by us are in strict compliance of quality and offered to the customers at reasonable prices. Moreover, to meet the diversified demands of the customers.